We’ve all been there. After spending hours hunched over a dim screen and countless lives trying to beat that final boss level, we throw our hands in the air and rue the day we ever bought that cursed video game. But Gamer Sensei has your back – they offer one-on-one coaching for video games across all skill levels. Professional coaching exists in many different sports, and Gamer Sensei is bringing professional coaching services to the large and growing market of competitive gaming, or eSports. Coaching can take many different forms. 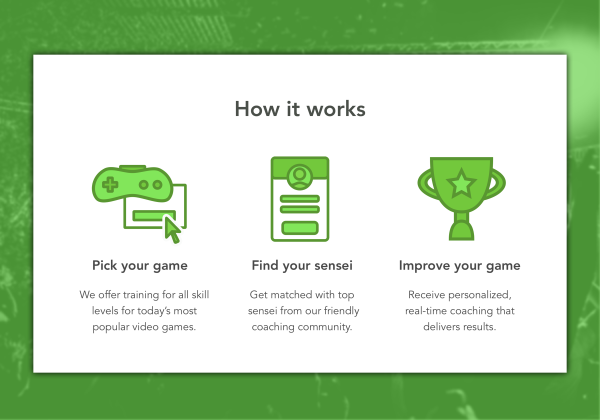 Sensei and pupil might play against each other, play together in co-op mode, or the coach may simply observe and give advice to the player via screen share. Gamer Sensei prides itself on being an approachable service for novice as well as professional level gamers as everyone can be better at the game they choose to play. The coaches are thoroughly vetted according to not only gaming skill, but also coaching ability. A good ‘bedside manner’ is just as important as imparted wisdom. Coaches may even engage in a sensei mentorship program wherein new coaches are taught how to coach more effectively. 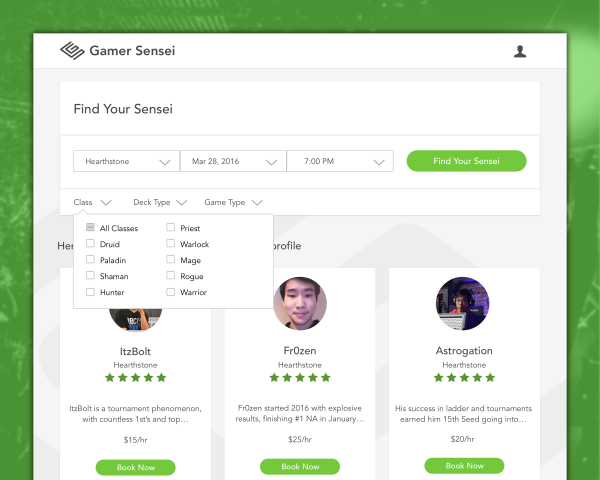 Funding: Gamer Sensei raised a $2.3 million round earlier this year with chief backers Accomplice Ventures and Boston Seed Capital. Revenue: Gamers lets Sensei set their own hourly pricing, typically $10-15. The company already has many sensei whose sole job is coaching on the site. Gamer Sensei is not releasing exact revenue numbers, but they are growing rapidly. Market Size: According to SpilGames, over 1.2 billion people play video games, or 17% of the world population. The market is worth a staggering $70B and expected to grow at 6%+ per year. With so much competition, it’s no wonder Gamer Sensei is growing rapidly. Market Shift: Mobile gaming and virtual reality gaming are on the rise. New platforms will allow for more interaction and more competitive gaming which should be great for the world, and Gamer Sensei. 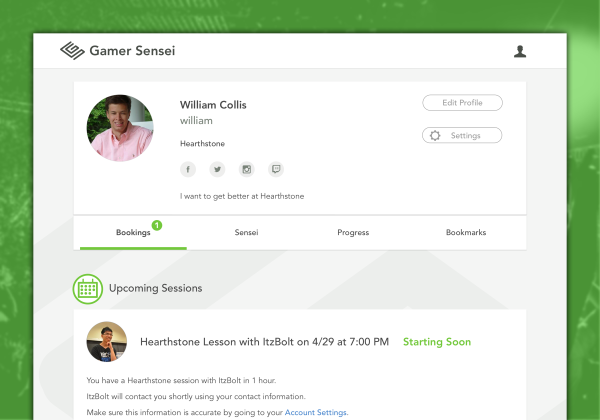 I sat down with William Collis, co-CEO and co-founder of Gamer Sensei. The genesis for Gamer Sensei was out of personal experience. William was trying hard to improve at Hearthstone and simply couldn’t crack the next rank. He eventually reached out to the gamer community for help and an idea was born. Along with William, the team at Gamer Sensei is comprised of passionate gamers trying to improve the collective skillset of their pupils. Gamer Sensei has very little competition – they are doing something no one else has done. This is both a challenge and opportunity as the company has the first mover advantage but also has a steep learning curve. Over the next 24 months, Gamer Sensei is looking to build out their product further, taking it from Beta into full production mode. The company wants to continue to attract top talent for coaching and focus on marketing to the large and growing base of hungry gamers.